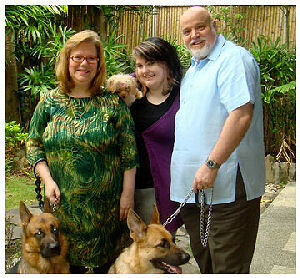 David and Beverley Sumrall have pastored the Cathedral of Praise in Manila for over 30 years. They are recognized for their pioneering achievements in organizational church leadership structure through home-based Bible studies, regular pastoral visitation, strong evangelism programs, world-standard Bible and Music Colleges and cutting-edge praise and worship and Christian arts ministries. They desire to see more and more people grow and prosper in their walk with God. All church groups, the youth, the men, the choirs, the children's workers, are eager to participate in the community feeding programs. 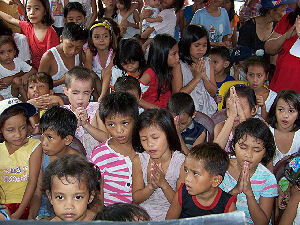 Each group of workers will prepare 500 meals in a week divided into five days of going out to the children. On the first day many give their hearts to the Lord and every day after they are taught more about their new found faith. Saturday is a great celebration day and children receive a beautiful activity book that will continue to tell them about Jesus. While the children sing songs, listen to Bible stories and learn memory verses, the adults are taken separately where they are taught on a deeper level about their walk with the Lord. 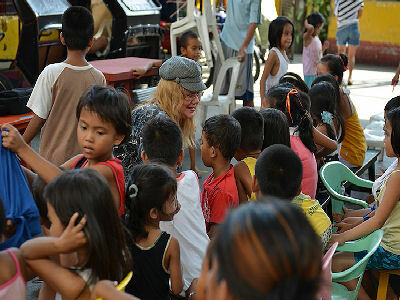 The Gerard Chapman Kitchen operates in one of Manila's poorest neighbourhoods. 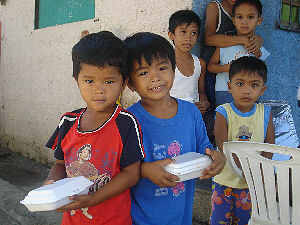 When the children receive the food they are so happy. For many, it is their only meal of the day. They and their families have always believed this is their "fate." That they will always be poor and there is nothing any of them can do about it, that God is there, but not necessarily involved in their lives. 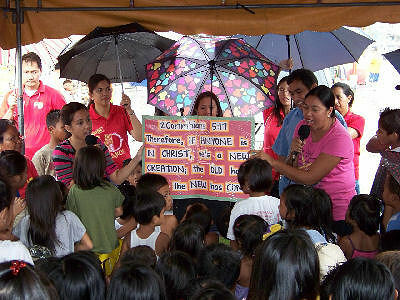 When they attend these feeding programs, they receive the good news that Jesus loves them and wants very much to walk with them in newness of life. They become involved in Bible Studies in their area, and in many cases, are water baptized and begin attending church regularly. Sunday Line is proud to partner with Pastors Dave and Bev Sumrall and the Cathedral of Praise as they seek to bring hope and opportunity to some of the very poorest children. Your gift to help in this important work is truly appreciated.